A hand injury at work is one of the most inconvenient, productivity-killing and potentially dangerous on-the-job accidents. According to the U.S. Bureau of Labor Statistics, there were over 143,000 workplace hand injuries in 2015 alone. Warehouse workers, who often spend their days operating machinery and moving heavy cargo, are especially at risk. When you’re choosing hand protection for yourself or your employees, consider these nine key features, all available in RefrigiWear gloves. Every warehouse is different, so some may be more important than others for your individual needs—but what all of these have in common is that, under the right circumstances, they’ll protect your hands when it counts the most. Here are nine product features you should look for when purchasing warehouse gloves. 1. Protective Padding If your gloves aren’t protecting your hands from cuts, abrasions and impacts, what are they doing? Rubber, nylon or PVC padding on your gloves is important for protection against the everyday hand hazards of warehouse work. Where possible, padding should be present on both the front and back, and it’s a good idea to also look for padding that protects vulnerable spots like knuckles. RefrigiWear’s Insulated Impact Pro Gloves feature tough impact protection plates on the knuckles, fingers and backs, as well as 100g Thinsulate® insulation for warmth. 2. Insulation When you work in a cooler all day, you know how easily your hands can get cold. Cold transfer from grabbing product, wind chill from driving a lift and 8 – 12 hours spent in the cold all contribute to cold hands. RefrigiWear’s Extreme Freezer Gloves with Key-Rite Nib don’t just protect down to -30°F, they include a touchscreen- and keypad-friendly finger nib so you don’t have to remove your gloves for data input—more on those later! 3. Waterproofing Like insulation, waterproofing isn’t an essential feature for every warehouse worker’s gloves, but for the ones who do need it, it’s indispensable. Our Waterproof High Dexterity Gloves include Hydroguard waterproofing technology as well as a moisture-wick polypropylene lining to give your hands maximum moisture protection. 4. 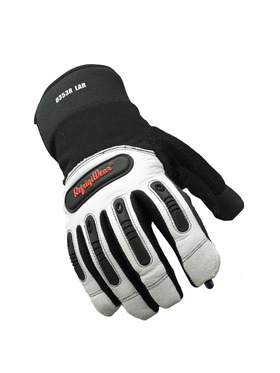 Flexible Construction ﻿Bulky, inflexible gloves cause more headaches than they are worth. That’s why RefrigiWear has the PolarForce™ Glove with Performance-Flex, made to provide the ultimate in warmth without sacrificing movement. 5. 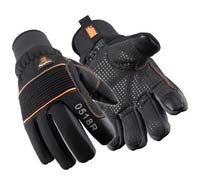 Palm and Fingertip Grips Warehouse gloves shouldn’t just allow you to do your job; they should help you do your job better. Patterned grip pads on the palms and fingertips of your gloves can be a huge help in safely handling product and machinery. Consider gloves like the RefrigiWear ArcticFit® Max, which feature a high-traction silicone pattern. 6. HiVis Coloring High-visibility features on employee clothing is a required safety precaution in many warehouses. If it’s a requirement you have to meet, check out the RefrigiWear HiVis Super Grip with Key-Rite Nib for a HiVis glove with the warmth and durability you expect from RefrigiWear. 7. Thumb Crotch Reinforcement A glove’s thumb crotch (the spot between the thumb and index finger) often needs additional reinforcement because it gets stretched more than almost any other part. Many of our high-flex models such as the PolarForce™ with Performance-Flex and Ultra Dex Gloves feature thumb crotch reinforcement for improved durability. 8. Touch-Screen and Keypad Nibs There’s a good chance your warehouse uses touchscreens or keypads for security and inventory management. Hand protection is pointless if you are always removing it to do data entry. Our Key-Rite and Touch-Rite models include nibs that save time, energy and hand warmth. 9. Ergonomic Fit You are working hard enough on your shift – don’t make your hands work harder. Our pre-curved ergonomic fit mimics the natural shape of your hands, reducing fatigue. It’s one of the many features in our Ergo Goatskin Gloves with Key-Rite Nib. Preventing hand injuries is a win-win for everybody in your warehouse. The best way to keep risk low? Hand protection that’s comfortable, sturdy and durable (and hey, just because it’s work doesn’t mean you can’t go for a little style). That’s where RefrigiWear comes in with over 65 years of experience making quality protection for some of the hardest-working folks around.